The seminars will take place the 3rd of november 2017, at 2h30 pm and 3h15 pm, in the IECB amphitheatre, 2 rue Robert Escarpit Pessac. Martin Smith is Professor of Organic Chemistry at the University of Oxford, and the Old Members' Helen Martin Fellow at University College, Oxford. He is also co-director of the CDT in Synthesis for Biology & Medicine. He came up to the University of Oxford from Middlesbrough for his undergraduate studies, then worked with Professor George W. J. Fleet on the chemistry of carbohydrate amino acids, gaining his DPhil in 1999/2000. He then moved to Pembroke College, University of Cambridge as the Drapers Company Research Fellow, to work with Professor Steven V. Ley CBE FRS. In 2003 he began his tenure as a Royal Society University Research Fellow in the Department of Chemistry, University of Cambridge. The group moved to the University of Oxford in October 2008.
an autoinductive phase–transfer initiated 5-endo-trig process, K. Sharma, J. R. Wolstenhulme, P. P. Painter, D. Yeo, F. Grande-Carmona, C. P. Johnston, D. J. Tantillo & M. D. Smith, J. Am. Chem. Soc. 2015, 137, 13414-13424. 2. Catalytic enantioselective synthesis of indanes by a cation-directed 5-endo-trig cyclization, C. P. Johnston, A. Kothari, T. Sergeieva, S. I. Okovytyy, K. E. Jackson, R. S. Paton & M. D. Smith, Nature. Chem.2015, 7, 171-176. 3. Catalytic enantioselective synthesis of atropisomeric biaryls: a cation-directed nucleophilic aromatic substitution reaction R. J. Armstrong & M. D Smith, Angew. Chem. Int. Ed. 2014, 53, 12822-12825. 4. Catalytic enantioselective synthesis of C1 and C2-symmetric spirobiindanones through counterion-directed enolate C-acylation, B. F. Rahemtulla, H. F. Clark & M. D. Smith, Angew. Chem. Int. Ed. 2016, 55, 13180-13183. 5. Catalytic enantioselective synthesis of atropisomeric biaryls by a cation-Ddrected O-alkylation, J. D. Jolliffe, R. J. Armstrong & M. D. Smith, Nature Chem. 2017,9, 558-563. 6. A counterion-directed approach to the Diels-Alder paradigm: cascade synthesis of tricyclic fused cyclopropanes, E. Kiss, C. D. Campbell, R. W. Driver, J. D. Jolliffe, R. Lang, T. Sergieiva, S, Okovytyy, R. S. Paton & M. D. Smith. Angew. Chem. Int. Ed. 2016, 55, 13813-13817. 7. A cascade strategy enables a total synthesis of gephyrotoxin, S. Chu, S. Wallace & M. D. Smith, Angew. Chem. Int. Ed. 2014, 53, 13826-13829. 8. A cascade strategy enables a total synthesis of morphine, S. Chu, N. Münster, T. Balan & M. D. Smith, Angew. Chem. Int. Ed. 2016, 55, 14306-14309. 9.Visible light photocatalysis of 6π heterocyclization,Niels Münster, Nicholas Parker, Lucy van Dijk, Robert S. Paton & Martin D. Smith, Angew. Chem. Int. Ed. 2017, 56, 9468-9472. Thierry Constantieux was born in Pau (France) in 1968. After studying chemistry at the University Bordeaux I, he completed his Ph.D. under the supervision of Dr. J.-P. Picard and Dr. J. Dunoguez in 1994. In 1995, he was appointed as Assistant Professor at the University of Aix-Marseille III (France). He completed his Habilitation in 2004 at Aix-Marseille Université (France), where he is currently full Professor of Organic Chemistry. His main research interest is focused on the development of new eco-compatible synthetic methodologies, especially enantioselective organocatalyzed cascades and domino multicomponent reactions from 1,3-dicarbonyl compounds, and their applications in heterocyclic chemistry. 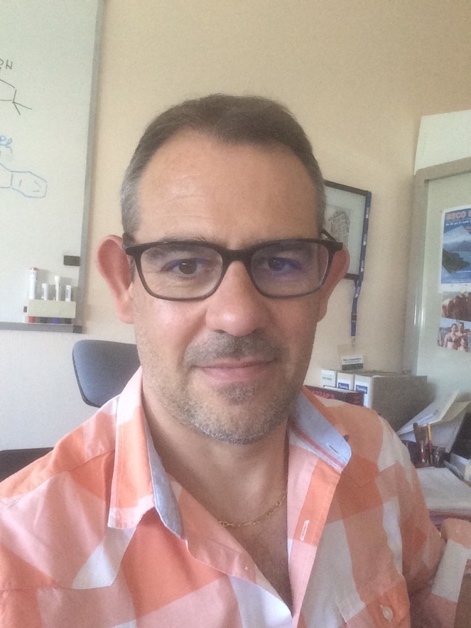 Since 2012, he is the scientific coordinator of one of the four research teams (STEREO team, 14 permanent people) of « Institut des Sciences Moléculaires de Marseille » (iSm2). In 2015, he was elected as Director of the Doctoral School of Chemical Sciences, at Aix-Marseille Université. A general perspective of the research program aimed towards the preparation of polycyclic heterocycles by the means of enantioselective organocatalytic reactions will be presented. β- Dicarbonyl compounds are generally used as pronucleophiles in the synthesis of these heterocycles and their polyfunctional nature makes them ideal substrates for multiple- bond-forming transformations (MBFTs) including domino processes and multicomponent reactions.